Grand-Métis - Les Jardins de Métis / Reford Gardens opened for the 2018 summer season on Saturday, June 2 with a special focus on the gardens’ creator, Elsie Reford. The new permanent exhibition Elsie through the eyes of… opens in the historic Estevan Lodge. The exhibition explores the fascinating story of Elsie Reford, a life that was rich and unusual. One of the leading women of her time, with grand ideas for society and many ambitious projects to her credit, the exhibition offers an opportunity to discover this and much more. On visiting her gardens for the first time, you might think it was the work of a lifetime. In fact, she started gardening at age 54. Before becoming passionate about plants and horticulture, her passion was to change society and make it better. Completed with a budget of $355,000, created and designed by the Montreal firm Umanium, the exhibition has been produced by Les Amis des Jardins de Métis. It allows visitors to discover the extent to which Elsie Reford was determined to make her convictions known and to take on projects with courage and determination, projects that were not limited to her own world and that of her family, but would improve society and of women’s place in it. At the beginning of the last century, Elsie Reford firmly believed that woman should have an opportunity to assume their voice and to play a role in improving their conditions. This is one of the reasons that led her to found the Women’s Canadian Club of Montreal in 1907, where women could, for the very first time, hear speeches by the influential politicians of the day. Her insistent letters to Prime Minister Sir Wilfrid Laurier, asking him to give the inaugural speech to the Club are on display. In the end, it was her future friend and mentor Lord Grey who gave the first address. Their meeting was one of the turning points in her life. She become one of his disciples and would carry on an active correspondence with him until his death. Especially interested in the health of women and children, she was very involved in the Montreal Maternity Hospital and the Victorian Order of Nurses. The two world wars were events that shaped her life. Her eldest son Bruce had an illustrious military career. She endured the First World War as a worried mother, all the while mounting the podium to make controversial speeches in defence of conscription. Alongside her husband, Robert Wilson Reford, she was participated in the supervision of the construction of their home on Drummond Street in Montreal and the enlargement of Estevan Lodge, the historic fishing lodge at the heart of her estate in Grand-Métis. The exhibition lifts the veil that have covered many aspects of the life of Elsie Reford that will surprise and inspire, just as her gardens have done for decades. Project leader Sylvain Legris and archivist Marjelaine Sylvestre worked with historians Alexander Reford and Karine Hébert for more than a year in identifying the themes and researching the testimonials chosen to illustrate Elsie’s true nature. The team from Umanium, museum designers with more than fifty exhibitions and productions completed since 2004, started from this research to imagine the scenario for the exhibition and bring it to life in Estevan Lodge. With the help of many partners and archival collections, the exhibition is rich in iconography and objects that allow new stories to be told. The new exhibition also reveals the woodwork of Estevan Lodge, hidden for more than a decade. 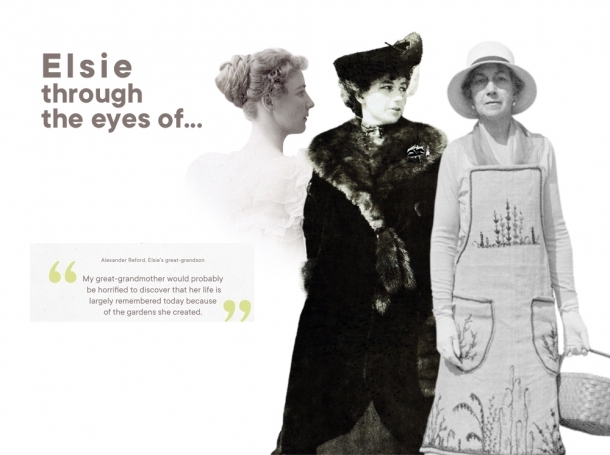 The exhibition Elsie through the eyes of… has been made possible by a grant of $265,000 from the ministère de la Culture et des Communications of the Québec government as part of their program to support permanent and travelling exhibitions. National historic site, Les Jardins de Métis / Reford Gardens is recognized as one of the great gardens of North America. The gardens were created by Elsie Reford from 1926 to 1958. Open to the public since 1962, they are a must-see attraction for those visiting the Gaspésie and the Lower St. Lawrence regions of Québec. A visit of the historic gardens and the historic Estevan Lodge is complemented by a wide-ranging program of cultural events in the visual arts, music, literature and the environment. The International Garden Festival presents 25 contemporary installations that are playful and interactive as well as La Grande Table, a culinary festival that offers new tastes and flavours built on Québec’s unique culinary heritage. Elsie Reford is at the heart the programming for Les Jardins de Métis / Reford Gardens for 2018. In addition to the new permanent exhibition, photographer Catherine Arsenault will present a temporary exhibition La fabuleuse trajectoire de Madame Elsie on the interpretive screen and in Estevan Lodge. Author and biographer of Elsie Reford, Hélène Jasmin, is preparing an agenda inspired by Elsie Reford Les saisons d’Elsie – Le livre des jours. Les Jardins de Métis / Reford Gardens are open every day, from Saturday, June 2 to Sunday, October 7, 2018. Admission is free for children 13 and under. Visit www.refordgardens.com for further information.